Sundrop Farms: practical agriculture in the desert? Maybe, I hope this South Australia new venture isn’t just hype. This uncritical article makes it look to be economic for specialty, high-value crops: Growing food in the desert: is this the solution to the world’s food crisis? (…) Indeed, the work that Sundrop Farms, as they call themselves, are doing in South Australia, and just starting up in Qatar, is beyond the experimental stage. They appear to have pulled off the ultimate something-from-nothing agricultural feat – using the sun to desalinate seawater for irrigation and to heat and cool greenhouses as required, and thence cheaply grow high-quality, pesticide-free vegetables year-round in commercial quantities. So far, the company has grown tomatoes, peppers and cucumbers by the tonne, but the same, proven technology is now almost ready to be extended to magic out, as if from thin air, unlimited quantities of many more crops – and even protein foods such as fish and chicken – but still using no fresh water and close to zero fossil fuels. Salty seawater, it hardly needs explaining, is free in every way and abundant – rather too abundant these days, as our ice caps melt away. 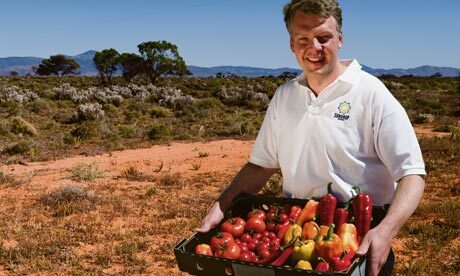 So well has Sundrop’s 18-month project worked that investors and supermarket chains have lately been scurrying down to Port Augusta, making it hard to get a room in its few motels, or a table at the curry restaurant in the local pub. Academic agriculturalists, mainstream politicians and green activists are falling over each other to champion Sundrop. And the company’s scientists, entrepreneurs and investors are about to start building an £8m, 20-acre greenhouse – 40 times bigger than the current one – which will produce 2.8m kg of tomatoes and 1.2m kg of peppers a year for supermarkets now clamouring for an exclusive contract. It’s an inspiring project, more important, it could be argued, than anything else going on in the world. Agriculture uses 60-80% of the planet’s scarce fresh water, so food production that uses none at all is nothing short of miraculous. I can see this possibly working for the Whole Foods class marketplace. I don’t see how it can be very relevant to the big boost in agricultural productivity that Africa requires. That needs industrial-scale farming, not greenhouses and fairly tricky tech. If you have seen any objective analysis of the Sundrop economics, please comment with the links. It will be nice if it works out and proves practical for growing large amounts of food. My attitude is wait and see.